From banking to shopping, most of us engage in key everyday tasks online. The data flying through the ether is more valuable than ever. Whether you use a Mac or a PC, an antivirus program can help you protect your most sensitive information. In the second quarter of 2015 alone, an estimated 21-million new malware threats (PDF) were created, while Macs experienced more malware attacks on OS X in 2015 than ever before..
Malware can include viruses which stop computers from working properly; Trojans that allow hackers a door into a user's system, compromising personal information; and increasingly, ransomware, such as the virulent, still-active Cryptolocker, which encrypts files, rendering them inaccessible unless the user pays a ransom. There are many free antivirus programs that do a good job of blocking malware before it can get a foothold in your system. Yet the best antivirus falters against one of the most common reasons behind a hack – negligence. Phishing - where users are tricked into clicking links that can download malware or fraudulently request login information - is on the rise as email attacks grow more sophisticated, for example, by using official-looking logos from institutions including banks, retailers and computer companies such as Apple. Apple is now the most phished brand in the world, perhaps due to the growing raft of login details tied to an Apple ID – email, iTunes Store and, through Apple Pay, a user's bank account. Blocking phishing links, whether in email or websites, is the sort of thing that could make a paid-for antivirus program worth the investment. That said, if you're the savvy sort that would never click on a pop-up ad, or open an attachment in an email from Amazon that misspelled your name, a free antivirus program with no bells and whistles could be sufficient. Many run on the same malware detection engine that powers their paid-for counterparts. However, free versions often impact a computer's performance more, while paid-for programs usually have a lineup of extra security features including alerts of malicious sites, blocks for spam and phishing links, additional encryption for financial transactions, and password managers (so you don't need to remember your dozens of uncrackable pass-phrases). Will it slow my computer's performance? You can check the performance impact of most antivirus programs at independent testing labs such as AV-Test or AV-Comparatives. In general, paid-for software doesn’t tax your computer as much. Does it detect PC and Mac malware?– Being able to detect malware for both major operating systems helps prevent you passing on dubious files to friends using a different OS. Continuous protection?- Some free antivirus programs only offer on-demand virus scans; a bit like locking the stable door after the horse already bolted. Real-time scanning is preferable, but can impact performance. Suspicious site alerts?– Usually a feature of premium antivirus programs, can block phishing emails and access to malicious sites; handy if kids or the less tech-savvy are using your computer . Data protection? – Some software offers specific protection for bank and/or credit card details, for example. 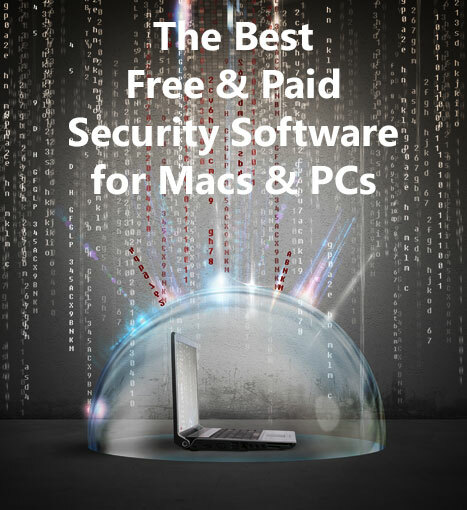 We scoured the web for security suites for Mac and PC, both free and paid-for. In all cases, the software cost less than $100/year, is targeted towards home users, and received high scores on performance and protection from independent testing labs. One of the pricier options around, Kaspersky Total Security offers a hefty lineup of security features for PCs. Along with real-time scanning for malware, the software runs instant safety checks on downloaded files, and uses a set of machine learning algorithms in order to identify new and unknown malware. Over at AV-Test, independent testing found that Kaspersky's antivirus engine caught 99.9% of malware samples with minimal slowing of the computer, and zero-second lag on tasks including downloads, program installations and copying data. The software also scans websites for suspicious behavior and alerts you of potentially malicious sites, while an URL adviser displays a particular site's security and reputation. Its Safe Money tech checks that banking, payment and retailer sites are safe—then opens the site in encrypted mode. An on-screen virtual keyboard defends from keyloggers that can send back your passwords to a cyber criminal. You can also enable a private browsing mode that blocks trackers – a good way to browse anonymously without having to download a new browser or a raft of privacy plug-ins. Data backups are automatic and scheduled so that if ransomware or a virus takes down your computer, your data can be restored. If you have children, the parental controls let you manage your kids' downloads as well as restrict access to inappropriate content. Cost: $45.33 on Amazon. Covers three devices for one year. High school has taught us that popularity doesn't necessarily equal success, but one reason to go for the most popular antivirus solution is that the more customers use a software, the more viruses and malware pass through its shield – and the better the software becomes at recognizing new malware. Avast Free is used by 230-million customers in 186 countries and according to AV-Tests of the 2016 version, it detected 99.8% of the malware samples it was tested with. Frequent mini updates to the software instead of occasional large downloads means there's a less noticeable toll on system performance – AV-Comparatives found that Avast Free was the lightest of all PC antivirus, including paid software (PDF, page 9) . (However, the Mac version was found by AV-Test to impact system performance a lot more, as it scans downloading files one by one instead of after the download). The 2016 version further updates the interface with a row of icons along the top with easy-to-grasp images and labels and lots of optional settings. It too has already received a number of outstanding reviews. While many free antivirus programs only clear malware, Avast's free edition also includes a free syncing password manager – allowing the user to remember one password instead of several to log in all over the web – as well as a browser cleaner to remove unwanted toolbars. Its overall interface is easy and friendly to users. Its Home Network Security feature scans your home Wi-Fi network for vulnerabilities hackers could exploit – and patches any it finds. If you're a Mac user considering purchasing antivirus software, the options for Apple devices can seem feature-light compared to the software available for PC. Symantec Norton Security is a real-time scanning security software that includes the bonus features common to PC security software such as scanning for phishing sites (and blocking access to the dubious ones), scanning email and instant messenger attachments and the ability to detect potentially risky applications. The Safe Web feature also alerts you to dangerous sites (such as those that may contain adware, phishing scams or other malware). AV-Test found that its impact on performance speed was minimal - and it caught 100% of malware samples thrown at it. So while this is a great choice for Mac, it's also a smart option if you're a Mac/PC household. If you shell outfor the multi-device option, one year's subscription covers up to five devices on Android, iOS, PC and Mac. That's handy even if you're not a multi-device household – smartphones are increasingly the transmitters of our most sensitive personal and financial info, and running Symantec's smartphone app on yours can secure all that cybercrook-luring data. No matter the OS, if you download a virus that Symantec experts can't remove, there's a money-back guarantee. Unfortunately, the Mac version has no option for automatic data backups (as there is for the PC edition) – but this remains a sleek, easy to use way to manage security for more than one device. While paid-for antivirus software comes with extra security features, there are some free options with solid performance when it comes to blocking malware and flagging dodgy websites. Sophos Home, which used to be known as Sophos Antivirus for Mac, can block Windows and Mac malware without overly slowing your computer's performance. When tested by AV-Test (in its previous incarnation, which uses the same malware engine) Sophos Home detected 100% of the malware samples sent its way with a performance lag of 20% in activities such as downloading or copying files (a 10% lag wouldn't be noticed by most users) – the least impact of all the free Mac antivirus software tested. The same version also detected and neutralized 100% of the malware samples in testing by AV-Comparatives (PDF, page 60). If you install Sophos Home on more than one computer – say, your partner's or kids' devices – you can view and manage their security settings from a single dashboard. Numerous blogs have suggested that the built-in features in Windows 10 preclude the need to add an additional anti-virus package to the OS. I’ve found that updates are frequent re: updated anti-virus, malware, etc., and there is little if any impact on PC speed. So far, no issues, and a few notes and warnings have been appropriate and effective. Windows built-in security software doesn’t perform as well as other free options. Last fall, the Windows 10 version of the software only caught 80% of 0-day malware attacks, inclusive of web and e-mail threats, according to AV Test. In the latest round, that percentage went up to 95%, but that’s still below the industry average. This has been typical of Windows security software performance, which is a big reason why it’s not our pick for free PC security software. “an operating system vendor offering good enough free protection “no that’s to “competitive” better have a word with av tests and get them to bash them to scare people to use our products. “and we’ll have a word with someone at the office get them to force our trial versions down customers throats” lol that’s how it is. “competition”. I like the mention of options for both PC’s and Apple computers. However, it would be nice to know exactly what software was tested to select the top three. For instance, did you check out BitDefender? (I am not affiliated with them! but in previous years it ranked much higher than Norton). I paid for the Avast security program. After d/l it, it didn’t seem like it was a complete d/l. I called the tech Dept to see if they could help. He said it was not d/l correctly and my computer needs to be cleaned up in order for Avast to work right. After I had already paid 39.95 for Avast, he offered to clean up my computer for an additional 119.00! I declined and also wanted to cancel Avast. This is a ridiculous bait and switch situation. I am having the hardest time cancelling Avast and getting my money back. Why is this happening?? What am I doing wrong?? Is this usual and customary?? Can't always trust the "uninstall"
I was recently lulled into a sense of security, and added a Slimware product, SlimDrivers (2.2) to my Windows 7 PC before doing any research on the program. Later on the same evening, I did do some research and every website I used said one thing…Do Not download anything from Slimware, or if you have already installed this program, delete it ASAP! And this wasn’t even the free version. I went for the $$ paid version. When I contacted Slimware support, explained what had happened and said I would like to have my money back, but was more concerned to remove the product from my PC. I was given a refund, +for them, however when they transferred me to one of their support techs, man was that guy rude! (which I am finding more often this year than ever before) While trying to make me sound like a total idiot, the man said “go into your programs window and find something called a ‘Control Panel’, which is when my better self told me to calm down. Once I opened my control panel and was already looking at installed programs, he caught up to me and said all you had to do was delete the program. And he really did not like me questioning him about was he sure that was it? And was he sure this might leave something behind? He was absolutely positive this would take everything out. Well, guess what I found in the Program Files in my (C:) drive? Yep, a folder that says SlimWare Utilities and a subfolder labeled Services. Can’t delete either of them due to a file of some name is open somewhere in my PC. Sent them an email yesterday to please contact me about removing everything left behind. Still waiting for a reply. So, I am just trying to say, you can’t always trust the software you want to be rid of to actually help you do that. There’s no reason why your computer would need to be “cleaned” for Avast to work correctly, unless you simply don’t have enough space on your hard drive to download it, which seems highly unlikely (Avast is not that big a program, so if your hard drive is that full, you would have bigger issues with your PC). Were you able to get this issue resolved with Avast? I had never heard of this one until I purchased a laptop online and was offered it. I have since heard great things about it from friends who are using it. I now have it installed on my PC and it seems to be working very well. While Vipre hasn’t been rated quite as highly as Kaspersky in testing, it is a very good program and should serve you fine. Avast is one of the best antivirus software. I am using Avast free Antivirus on my Windows PCand it works smoothly. Kaspersky can be a good paid antivirus. Avast is a nightmare of nagware popups, computer slow-downs, and more computer slowdowns. Did I mention nagware popups? On my PC it WAS the malware I was trying to avoid. So I uninstalled it and never even tried it on my Mac. Nod32 use to ranked vary high on tests, now I seldom read about it. What happened? We see it pretty commonly that antimalware programs that perform well one year, fall in the rankings the next. Often, this is due to not being up to date on the latest threats. However, we do tend to see the usual suspects at both the top and bottom of the rankings. Also, sometimes antimalware providers bring out new versions which may impact your PC’s performance more (or less) than the prior version, which can also affect rankings. Since each antimalware testing lab uses different methodology, we look at the latest results from the major labs and form a holistic view of which is our recommendation for the top pick. And even id the program you use isn’t at the top, it’s still better than using no protection at all. I was also wondering about Nod32 like LJ, it’s between that and Avast for me right now. Been a few years since I had to make a choice for antivirus. In most cases, the distinctions between antimalware products has been getting smaller over the years. All are improving in antimalware detection (thanks to sharing threat information) and performance impact on your computer. In the past, ESET hasn’t been one of our favorites, but the product has been improving in tests. Today, both ESET Nod32 or Avast should serve you fine, if that’s your preference over Kaspersky. I’m a long time customer of avast but they are really pulling the strings these days. Installing browser extensions and other stuffs without permission, eating up bandwidth… Highly dissapointed! That’s great and all but what about Anti-Malware software like MalwareFox? I understand that some of these Antivirus programs offer some of the features that Anti-Malware ones have, but it’s not the same thing. So, do you have a similar list for Anti-Malware? While the software programs above are still commonly referred to as “antivirus”, they are all, in fact, full anti-malware suites. So they are our recommendations for “anti-malware” protection. We would strongly recommend against going with programs like MalwareFox or others that have not been reviewed by the major anti-malware testing labs. There is no guarantee that these programs work as claimed (or work at all). How much "anti" is too much? I currently have Symantec Endpoint Protection, F-Secure (that I have not seen much of lately), Nero’s Tune It Up! and Rkill from Bleeping Computers all on my PC. I have read that having more than two maximum anti…... on your PC is overkill and they can cancel each other out. Yet not one of them (and this may be my unrealistic expectations) picked up on a folder that just showed up out of nowhere, while I was sleeping, that fell under Computer>Network>Gateway PC>>>a folder with a nickname I use in some sites to log in called A***x(Barbara-Gateway). I don’t know why I assumed a new folder using a login name from some website would raise some kind of flag. Like it did me. So, my first real question, Can too many antivirus or antimalware programs on one PC do more harm than good? Thanks to all who let me be a buttinski! I’ve been using Webroot for the last 3 years and have been very happy with it. But I never see you rank it. What are your thoughts on it? Our rankings are primarily based on the tests from a variety of independent testing labs. Unfortunately, Webroot is rarely included in this testing, making it difficult for us to judge its effectiveness. There was a positive review from PC Mag in 2016, and using Webroot is almost certainly better than no virus protection, but we just don’t have enough information to include it in our picks.